I know, the title of this post sounds a little weird right?! Although I’m not a dentist, I take my oral hygiene very seriously especially since I’m in people’s faces while adjusting their postures in yoga class and I’m always self conscious about having bad breath! I should probably cut down on my garlic intake but I’m Italian and some things will just never change. Besides brushing my teeth and flossing them, there are two more little tricks I have adopted over the years to help support a healthy mouth. 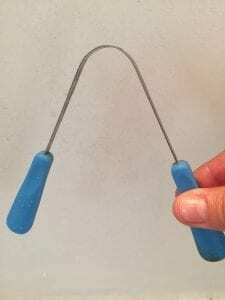 The first is called Oil Pulling and the second is called Tongue Scraping and you’ll need to purchase a jar of coconut oil and a tongue scraper both of which can be found at your local grocery/drug store. 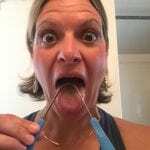 Never heard of Oil Pulling? It’s an Ayurvedic (a system of medicine with historical roots in the India subcontinent) technique also known as “kavala” or “gundusha” that involves swishing a tablespoon of oil in your mouth on an empty stomach for around 15-20 minutes. It’s exactly like when you use mouthwash except you do it for much longer. Some people use cold pressed sesame oil and that works just as well. You then spit out the oil into your toilet or trash- NOT your sink though as it will clog the drain! This is an amazing way to flush out all the toxins in your mouth and it will help you spend less at the dentist if you do it often. If you choose to do it daily, you will absolutely notice the effects! As the oil mixes with your saliva, and you swish it around, it begins to pull toxins out from your mouth, teeth, gums and tongue- say CIAO! to your bad breath too. It helps prevent bleeding gums, cavities and gingivitis. Does your jaw pop like mine? I have TMJ (Lockjaw) and have had it for years. The right side of my jaw pops (loudly) every time I open my mouth a little too wide (which is often if you know me well) and it is annoying if you’re not used to hearing it. Mr. Dentist suggested a procedure to help lessen the soreness in my jaw and of course I laughed at him because I’m not one for “unnecessary procedures.” Oil pulling is a holistic treatment for TMJ so I think I’ll stick to this method. Sorry Doc. Oh! And one last tip! 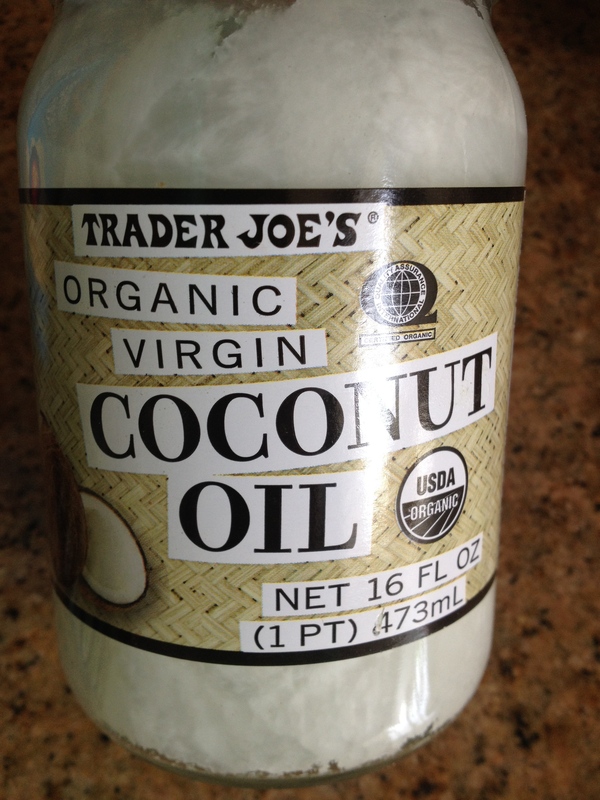 Coconut oil can also help you poop… yes, you read correctly! This stuff can help make you regular so if you’re in need, toss a tablespoon into your coffee (in my case tea) and let it melt. I add Vanilla Almond Milk and drink! Onto tongue scraping now…. this is not an Ayurvedic techniques but it is very useful in cleaning the white or colored coating on the upper surface of your tongue. Your tongue retains oral debris consisting of food, saliva and dead cells and by scraping it, you are ridding the body of bacteria and fungi that can grow on your tongue and are related to many common oral health problems and accounts for 80% of bad breath. 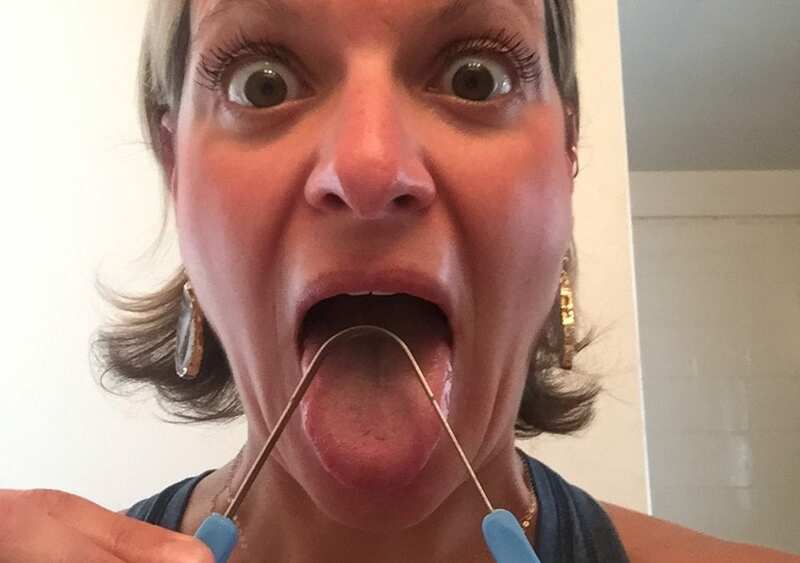 Usually, after I brush my teeth I scrap my tongue once or twice until it is red again… it’s MUCH MORE effective than just scraping your tongue with your toothbrush… just saying! Here’s a closeup… LOL! Lastly, students are always asking me about joint pain and how to help protect their joints, and I’m constantly suggesting they take Glucosamine! It’s got a ton of natural oils including fish oil, that helps lubricate joints, and it’s marketed to support the structure and function of joints. My Ma and I have been taking it for years, and I noticed a HUGE difference in my body after only about a month. And it has the reverse effect too; when I run out of it, I immediately feel the difference within a few days. So stop by your local drug store and pick some up today! And if you’re not down with popping pills, pick some some fresh fish and get cooking… you can get the same benefits from a nice piece of salmon! 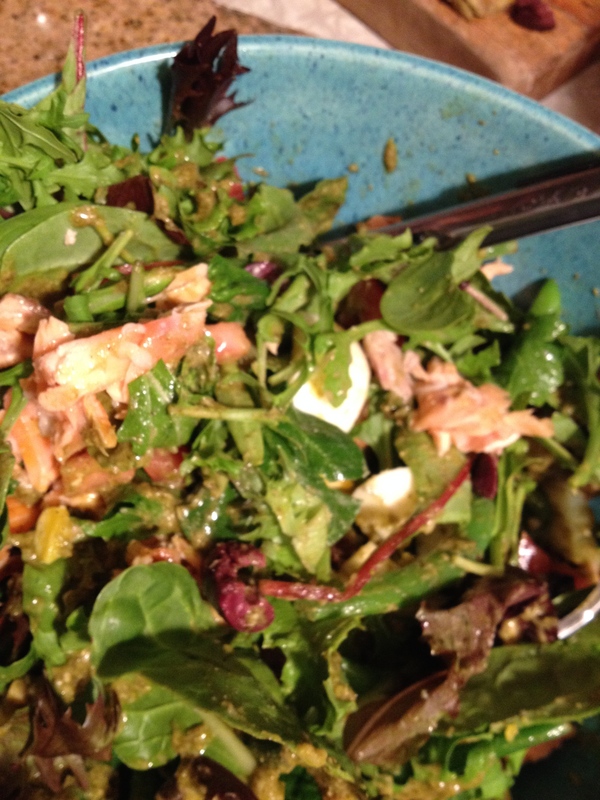 The recipe is below is my favorite way to make a Salmon Nicoise Salad… Enjoy! 1. Slice your potatoes and get those boiling first. 2. Snap the ends off the green beans and in a separate pot, start to bring them to a boil. When they are through, toss some cold water on them (blanch) and let them sit for a couple of minutes. 3. Cut up your olives, eggs and tomatoes and have them ready. 4. In a hot pan, add some olive oil and your salmon steaks/filets. They should take less than 5 minutes to cook if you like it medium-rare like me. 5. When the salmon has finished cooking, cut it up into small pieces. 6. 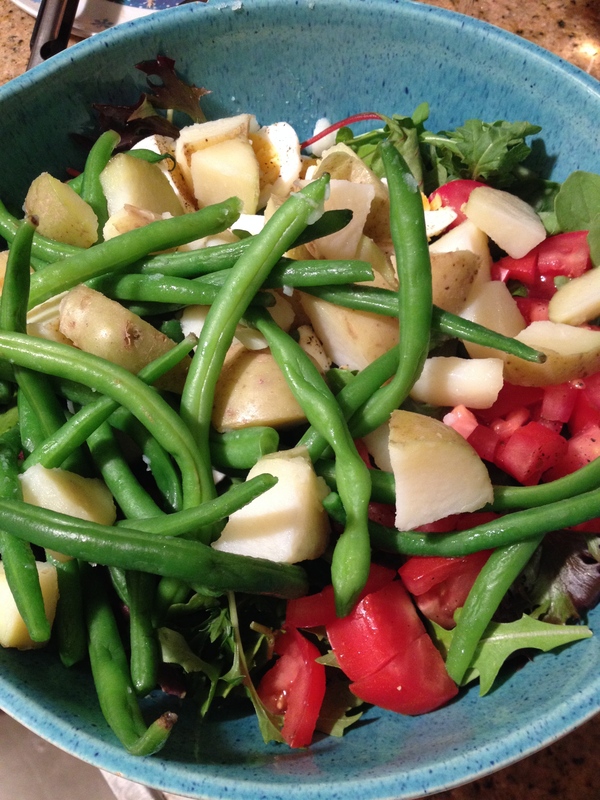 Add everything to a large bowl and toss with my Citrus Dressing and wallah! Yum! Here are four short videos for you today, free of charge! Work your CORE!!! from niccola nelson on Vimeo. Stretch your Feet from niccola nelson on Vimeo. Wrist Stretches from niccola nelson on Vimeo. Stretch Your Hips from niccola nelson on Vimeo.